I mailed a package to myself via EMS from Thailand to Ireland. Several weeks later it hasn't arrived in Ireland, and the tracking info is saying that it's still in Thailand, apparently being held there for pickup?? Can anyone explain what this tracking info means and what I should do now? I'm having trouble getting in touch with EMS and I don't speak Thai. On January 14 I mailed a package to myself from Ko Chang, Thailand to Dublin, Ireland via EMS. As a return address I put my home address in California because I was leaving Ko Chang and didn't have an address there. Now I've arrived in Ireland, expecting the package to be here waiting for me, but it's not. I tracked it on the website and the tracking info says this. I know what poste restante means, but I don't really understand what happened or why my package apparently went back to the origin and is being held there. I haven't been able to get in touch with EMS via the numbers provided; I sent them an email but haven't heard back yet. Is anyone familiar with mailing things internationally from Thailand? Am I right to assume the package is being held at the post office in Ko Chang for me to pick it up? If so, what the heck am I supposed to do now? I really need my package (it has all my winter clothes in it), and I paid like 4,500 baht to mail it so I'm really pissed off about this. If you're already near Ko Chang, might be worth it to go to the post office and see if they'll hand it off to you (bring documents!). My first thought was that your box is still in the limbo of Thailand's insane customs and import tax procedure (We had a package from Hong Kong sit in BKK for 3 weeks, which was sad since it contained cheese :( ), but from the status updates I don't really get that sense. Anyway, can't hurt to go and ask. If that is the case though, be sure to bring extra baht to cover whatever import tax they may have assigned. Shipping internationally is no fun. It hasn't been three weeks, I think you will have to release yourself from the stress and just wait. Meanwhile, buy a few secondhand warm items of clothing. I've mailed two dozen packages to myself from a dozen countries on 5 continents. 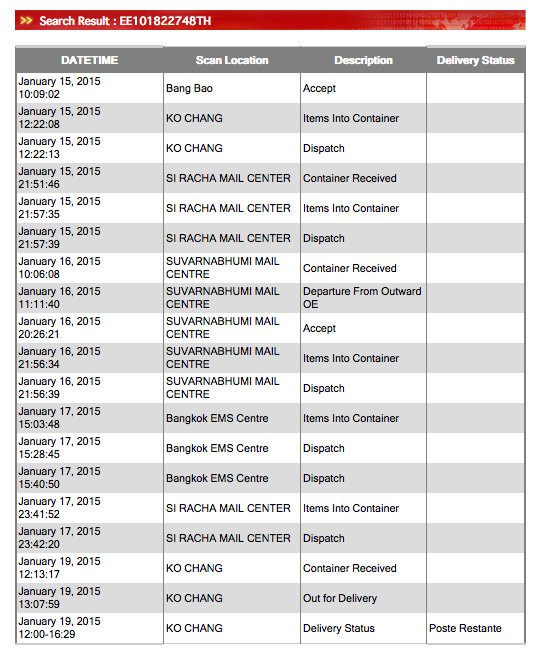 Asia is crazy- I had one package from India to the US promised in 2 weeks. I gave up after 3 months and it showed up in 5. I think the problem is that you put a return address on it that is not in Thailand. If they cannot deliver your parcel to the intended destination (Ireland), it would normally go back to the return address - but you put one in there that is outside the country as well, in the US. I would interpret the tracking info like you did. Do you know someone there who can go to the post office in your stead, authorized by you, and collect and re-mail the parcel for you?